To celebrate the 4A's 100th anniversary, Campaign US compiled the top 10 spots that have helped make the world a better place. Whether the goal is selling a product or saving a life, ads with a powerful message tend to stick out. This month, Campaign US is teaming up with the 4A's to celebrate the organization's 100th anniversary. 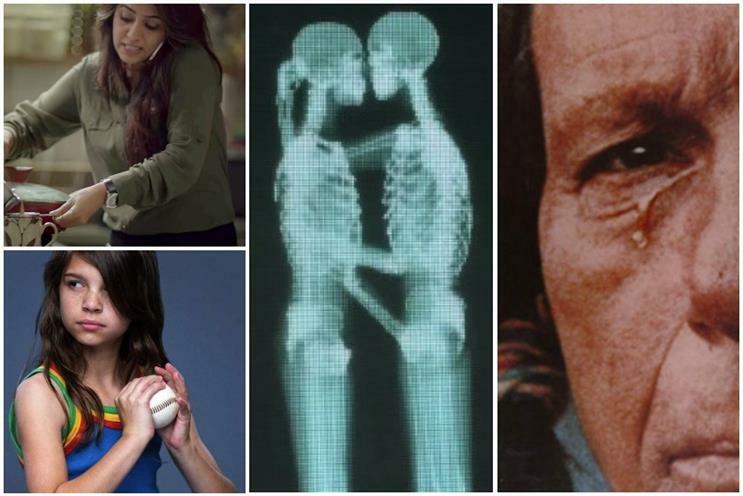 We're counting down the top 100 ads from the past century, including the most memorable campaigns for social good. Several have already changed the world for the better. As the longest-running PSA campaign in the history of the US, Smokey’s anti-wildfire activism has reached cultural saturation: 94 percent of Americans recognize the beloved ranger bear, who FCB West—which still runs the campaign—created in 1944. He used to get so much fan mail that he was granted his own zip code, 20252, in 1965. India consistently falls among the lowest-ranked nations for gender equality, with housework falling almost entirely on women’s shoulders. This ad addressing the disparity went viral in India and did the same in the US, thanks in part to a bump from Facebook COO Sheryl Sandberg. Drunk driving fatalities, long considered lamentable but inevitable tragedies, declined by over 15 percent in the 25 years following this campaign. While the Ad Council’s drunk driving slogan has since changed to "Buzzed Driving Is Drunk Driving," the original slogan is recognized by over 90 percent of American adults. This now-ubiquitous Texas pride slogan was created in the 1980s to shame Texans into not littering on highways, which at the time were inundated with trash. After landing the campaign, GSD&M was having trouble getting around the stodgy-sounding "litter" and found the perfect solution in the much-more-Southern "mess." The catchphrase they created is still printed on Texas garbage cans and tourist t-shirts alike. "Crying Indian" for Keep America Beautiful by Marsteller, Inc. Solicited by an anti-littering group composed largely of tobacco and soft drink industry companies, this 1971 Earth Day spot was credited with reducing litter by 88 percent within 12 years. Although its presentation relied on the stereotype of the noble "Indian," the actor who played the silent leading role, Espera "Iron Eyes Cody" Oscar de Corti, was actually Italian. This ad indicting the idea that women are weak began as consumer research: executives at P&G subsidiary Always learned that girls lose self-confidence once puberty begins, so they made a campaign to combat that idea, enlisting documentary filmmaker Lauren Greenfield to produce it. "Like A Girl" debuted online, aired during the Super Bowl—the only feminine care spot to do so—and went on to win the 2015 Emmy for Outstanding Commercial. Part of P&G’s "My Black Is Beautiful" campaign, "The Talk" drew heavy criticism from conservative groups for being supposedly "anti-white." But almost everyone else praised it for its honesty and high production value, which communicated the intergenerational toll of racism on black Americans. The first PSA to win an Emmy for Outstanding Commercial, this 2015 video and its ongoing campaign target implicit bias, a form of discrimination that influences everyday interactions and split-second decisions. By presenting a tough topic with a feel-good, heartstrings-tugging tone, the campaign has helped Americans feel like they can create a more accepting and inclusive environment. Endearing duo Vince and Larry won the smiles and the attention of Americans when they arrived in 1985 for a series of goofy PSAs on the importance of wearing seatbelts. While Burnett’s creative team had originally conceived a darker tone, with sentient dummies being dragged, horrified, toward their deaths, the BFF vibe of the final product proved a hit: the crash-test duo became pop culture icons, and seatbelt usage increased more than fivefold. President Kennedy’s humanitarian program confused much of the public when it was introduced in 1962, to the point where far fewer volunteers than desired signed up—especially among the able-bodied youth needed for so many missions. By showing the gritty details of an assignment and the humanitarian rewards it promised, Y&R’s spots succeeded in boosting signups; in 1991, 30 percent of enlistments came directly from the Ad Council recruitment campaign.